We opted to spend the morning and afternoon of Saturday, August 10th, on our own. We rode to Leland, Michigan, which was about an hour’s drive from our cabin. We ate breakfast at the Early Bird, located Downtown alongside Route M-22. We hadn’t planned on where to eat breakfast. We decided to play it by ear, choosing a restaurant based on its popularity. Early Bird is popular. I didn’t think there was a table available, when we arrived. Lucky for Bob and me a couple of tables were being vacated, as we arrived. The family ahead of us was seated first. Then we got a table. The service was prompt; breakfast was filling and scrumptious. After breakfast, we explored Fishtown. A photographer friend, who grew up in Michigan’s Lower Peninsula, in the area in which we were vacationing, suggested that we visit Fishtown. He said that there was lots to photograph in Fishtown, which is a historic fishing settlement. Fishtown is home to a working fishery and a thriving charter fishing business. The riverfront is lined by a boardwalk and quaint shacks that have been converted into tourist shops. Two Fish Gallery is up the hill from Fishtown. Two Fish Gallery is one of many shopping opportunities in Downtown Leland. We spent only a couple hours in Leland, including the time we spent eating breakfast. I was most interested in photographing Fishtown. We plan to return to this part of Michigan next year. I hope to spend at least a full day in Leland during that trip! There is so much to see and do there. Bob and I walked on the footbridge that is above the waterfall. I will share photographs from the footbridge later in this post. Behind us is the Leland River, Fishtown and Lake Michigan. As I edited the photographs of Fishtown, I thought how nice it would be to stay for a couple nights at Falling Waters Lodge (connected to the left side of the footbridge). The stay would allow for more immersion in the Fishtown scene than an hour’s visit, or even a day’s visit. I checked the room rates. The lowest rate for a standard room is $69/night OFF SEASON. 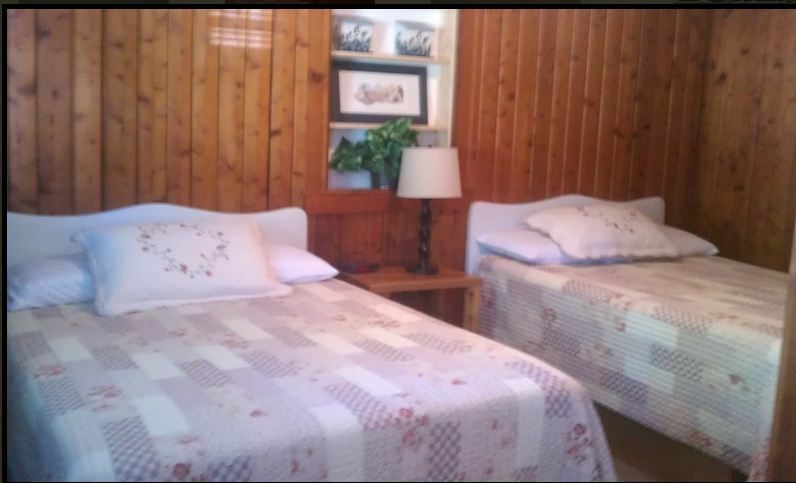 At the time we visited earlier this month, the lowest price was $232/night! I guess I’ll settle for a day stay, unless we can visit right after Labor Day when the price falls to $99/night. We returned to our cabin via Beulah, where we stopped for cherry pie and ice cream at The Cherry Hut. Our Vulcan Riders and Owners Club (VROC) friends told us to be sure to get a piece of pie at The Cherry Hut. We were waiting to be seated when in walked nine of our VROC friends. Our table for 2 became a table for 11! The cherry pie was worth raving about. The pie and ice cream were delicious! Bob and I returned to our cabin, where we relaxed for several hours. We went back to the Cycle-Moore Campground in time for dinner. We went to nearby Rico’s Cafe and Pizzeria with Jim and Sandy R., Ray and Lisa R. and John. Everyone, except for Bob and me ordered pizza. Bob and I ordered taco salads. I wish I had taken a picture of the taco salads. They were HUGE! After dinner, we returned to the campground. I took only one picture that evening at the campground. Art B.’s happy, relaxed smile shows how much fun it is for those in VROC to get together. We are one happy family, and it seems the next get together however close in time is too far in the future! Bob and I didn’t stay for long that night. We wanted to have an early night, as we would be leaving for home early the next day. We said our goodbyes to everyone, and I was in bed by 10:15 PM. The purpose for Bob and me to go to Michigan earlier this month was to attend the Vulcan Riders and Owners Club (VROC) motorcycle rally at the Cycle-Moore Campground in Interlochen. We knew very little about the scenic attractions in Northwestern Michigan before departing for the rally. We discovered that Northwestern Michigan is bountiful in scenic attractions. The best part of the rally was being able to ride with other VROC’ers on such wonderful scenic roads. Add camaraderie, friendship, a campfire, food and beverages to the scenic roads, and you have the makings of a good time. The campfire area is where tall tales are told and riding adventures described. It’s a kickback time, too, after a day of riding. Passing a variety of drinks around the campfire circle goes a long way toward kicking back! Today’s blog post showcases photographs from Friday night’s campfire (August 9th). It was a beautiful night for a campfire! Stay tuned; more details of our Michigan vacation to come! We rode alongside several bodies of waters: Platte River, Platte Lake, Little Platte Lake, Glen Lake, Lake Michigan, Crystal River, Narada Lake, Bass Lake, Little Traverse Lake, Lake Leelanau and Long Lake. That is quite a few bodies of water, and I am not certain that I mentioned them all! Our first stop was at the Philip A. Hart Visitor Center, which provided a good introduction to the Sleeping Bear Dunes National Lakeshore. Upon leaving the visitor center we went for a ride on the Pierce Stocking Scenic Drive. The following seven photographs were taken at various stops along the scenic drive. Sleeping Bear Dune rises 450 feet above Lake Michigan. People go down the dune and climb back up on their hands and knees. After riding the Pierce Stocking Scenic Drive we rode to Northport, where we ate lunch at the Garage Bar & Grill. Can you tell why this restaurant is named Garage Bar & Grill? After lunch we rode farther north in Northport to the Grand Traverse Lighthouse. There is a beautiful view of Lake Michigan from the lighthouse. We returned to the campground around 5:00 PM. 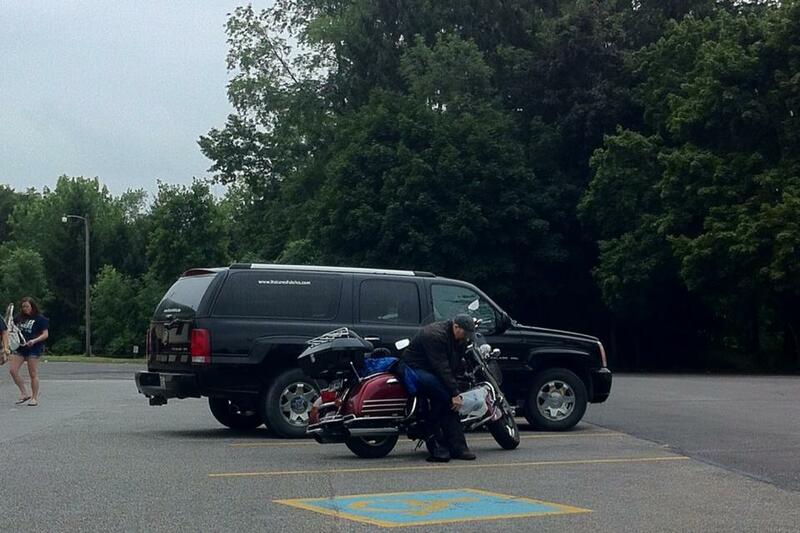 I want to thank Jim R. He drove the lead bike on our tour of the northwestern part of Michigan’s Lower Peninsula. He did a great job leading, as well as stopping at the important sights along the way. We rode the motorcycle back to our cabin and picked up the car, as we planned to stay longer at the campground than the previous night and wanted a warm ride back to the cabin. When we returned in the car to the campground, we went to dinner at The Hagen Room, located at the Interlochen Golf Course, with Jim and Sandy R. and David and Marlene S. Bob and I shared a steak and shrimp dinner, which was excellent. Upon our return to the campground we began congregating around the campfire — the subject of my next blog post. We spent the third day of our Michigan vacation (August 9) with our Vulcan Riders and Owners Club (VROC) friends. We returned to rally headquarters, Cycle-Moore Campground, around 8:00 AM. Jack and Margret ate breakfast at the campground. The dog’s name is Annie. Bob, Jim and Sandy R., David and Marlene S. and I ate breakfast at Dilbert’s Cafe, which was within walking distance of the campground. Bob and I had a filling breakfast. We each ordered omelets. Bob ordered toast with his omelet; I ordered a pancake. The pancake was the size of a dinner plate! We could have easily split one meal and had enough to eat for breakfast! After breakfast we relaxed at the campground for an hour or two, chatting mainly with Ray and Lisa R., Jim and Sandy R. and David and Marlene S.
This photograph of Sandy puts a smile on my face each time I see it. Around 10:30 AM twelve of us departed the campground on a 130-mile motorcycle ride–the subject of my next blog post. On Thursday, August 8, we drove from Norwalk, Ohio, to Honor, Michigan. We departed Norwalk around 8:15 AM and arrived in Honor at 2:45 PM. Our accommodation for three nights was at Cedar Ridge Cabins. 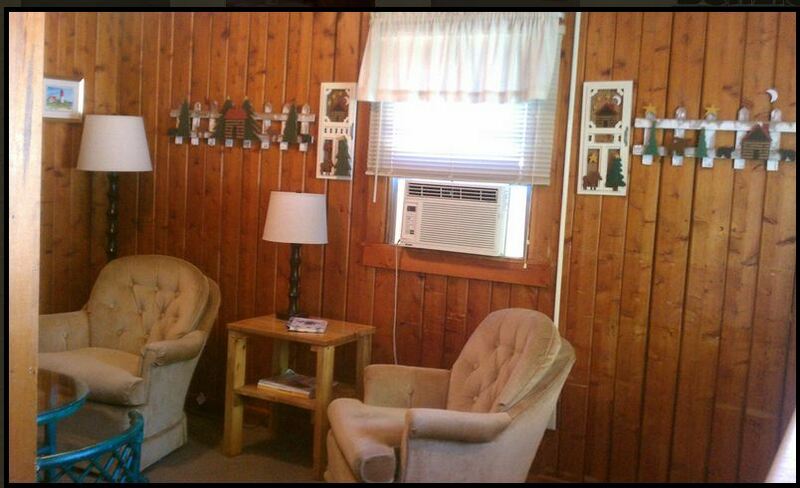 There are eight cabins available at Cedar Ridge Cabins. Each cabin offers modern bath facilities, air conditioning, cable television, small fridge, coffee maker and deck with picnic table. These three larger cabins have two full-size beds, as well as a kitchenette. We stayed in Cabin #6. I forgot to take pictures of the inside of our cabin. The three photographs that follow were obtained from the Cedar Ridge Cabins web page. Our cabin had two full-size beds. Our cabin had a small sitting area separate from where we slept. 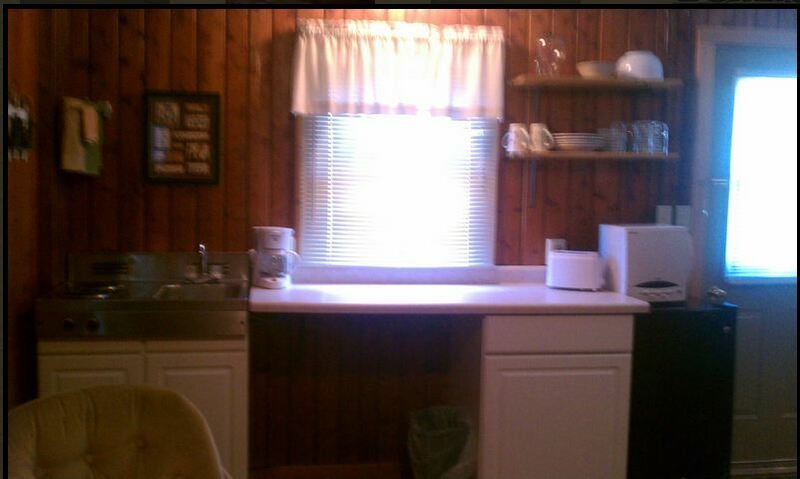 Our cabin included a kitchenette. Located behind the cabins are 3 acres on which you can play volleyball, play horseshoes, build a bonfire or hang out in the 16×16 recreation room. The backyard invites one to build a bonfire or play volleyball. We traveled approximately 360 miles on Thursday from Norwalk, Ohio, to Cedar Ridge Cabins in Honor, Michigan. Unlike our first travel day, we encountered no rain on Thursday … only dry roads and sunshine. The purpose of our Michigan vacation was to attend a Vulcan Riders and Owners Club (VROC) motorcycle rally. After getting settled in the cabin we rode the motorcycle to Cycle-Moore Campground in Interlochen, Michigan — the location of the rally. The campground was located about 11 miles from our cabin. With the exception of Bob and me, everyone else who attended the rally stayed at this campground. Bob and I signed this VROC banner sometime during the rally. We had not yet signed it, though, when I took this picture. A motorcycle rally has been held at Cycle-Moore Campground each year since 2002. We chatted with several rally attendees before heading out for dinner with Lisa and Ray R. and Marlene and David S. We ate dinner at Maddy’s Tavern. I don’t remember much about our menu selections. I do remember, though, that pretzels and mustard were brought to our table, while we were waiting for our meals. We sat on the outdoor patio, which was inviting and quite cozy. I had never met Lisa and Ray and was only minimally acquainted with Marlene and David from another VROC rally that we attended a few years ago. I enjoyed getting to know Lisa and Ray and furthering the friendship with Marlene and David during dinner. We returned to Cycle-Moore Campground after dinner. We chatted for a while with several other rally attendees before leaving for our cabin for the night. Stacey and Mike spent this past Halloween in Hell, Michigan. We received a postcard earlier this week, postmarked “Hell”. 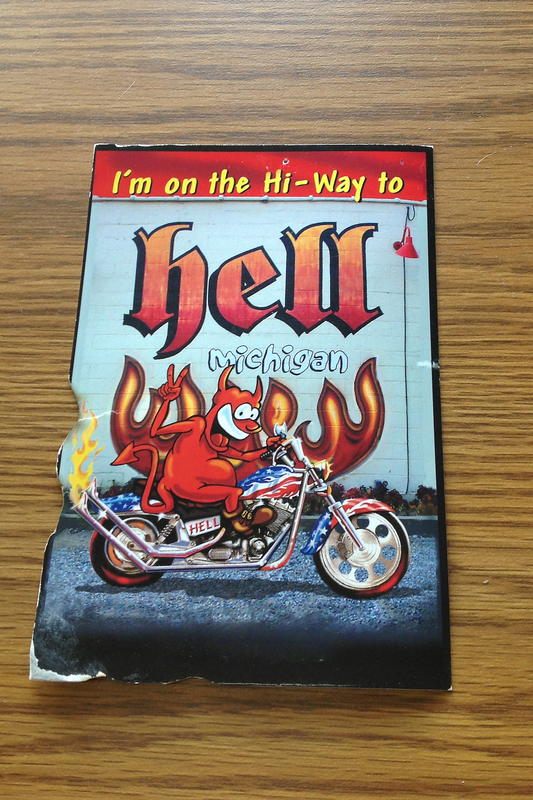 I checked out the website for Hell, Michigan. It looks like an interesting place to visit.